Leibnizian philosophy was supposedly based on two principles: the principle of contradiction which states that contradictions cannot exist and which should be the foundation of all logical truths and the principle of sufficient reason which should be the principle of all non-logical truths and which states that all non-logical facts must have an explanation. Wolff continues the Leibnizian tradition by placing these two principles at the beginning of his ontology. Yet, while the two principles were apparently indemonstrable for Leibniz, Wolff thought that he could deduce the principle of sufficient reason. As the only other axiom from which the principle of sufficient reason could be deduced is the principle of contradiction, Wolff has often been accused of making ontology a mere corollary of logic. I think it will be insightful to see whether this accusation holds. Although Leibniz's principle speaks of reasons, Wolff's zureichende Grund could as well or even better be translated as a sufficient ground. Ground, then, is something in a thing A that explains why a thing B exists. A and B could be the same thing, but if they happen to be different, A can then be called the cause of B. Warmth of air could thus be a ground for wilting of the plants, while the warm air would be the cause of the same wilting. The principle of sufficient reason in its Wolffian version states thus that all things must have a sufficient ground, that is, something explaining completely how they could exist. Wolff has two proofs for the principle of sufficent reason. Well, actually there is a third argument – Wolff states that the principle must be assumed if one is to separate a dream from a coherent experience – but this argument is clearly based on the presupposition that we can differentiate the two. Wolff's main argument is rather simple. Suppose there is something without any ground explaining it. Then it must have been generated out of nothing (Nichts). But as nothing can come out of nothing, everything must have a sufficient ground. At first sightWolff just appears to beg the question: the statement that something cannot arise out of nothing says just that all things must arise from some previous ground. Yet, we must be careful about how to interpret Wolff's terminology. Nothing, which Wolff speaks of, does not mean a mere state of there being no things. Indeed, Wolff admits that something can come out of a state of there being nothing, as long as it is a possibility that something could come out of this state. Instead, Wolff's nothing refers to something that cannot be or an impossibility: nothing can come out of nothing, because this ”nothing” is an impossibility that cannot ever be actualised. We are now in the midst of Wolff's use of modal terminology. I should firstly clarify a possible misunderstanding. Nowadays, we are accustomed to speak of possibility and impossibility in connection with propositions: it is possible, for instance, that tomorrow it will rain. For Wolff, on the contrary, possibility is a characteristic of things. Indeed, thing (Ding) means, according to Wolff, something possible. Thus, there are no impossible things (like round squares), or at the most, they are only imagined to be things, although in fact they are mere ”nothings”. Wolff also tells us that possbility is not by itself an actuality, but requires something to fill itself. This filling of the possibility appears then to be nothing else but the sufficient ground required for the existence of something. We may then picture the Wolffian structure of modalities through the following simile. 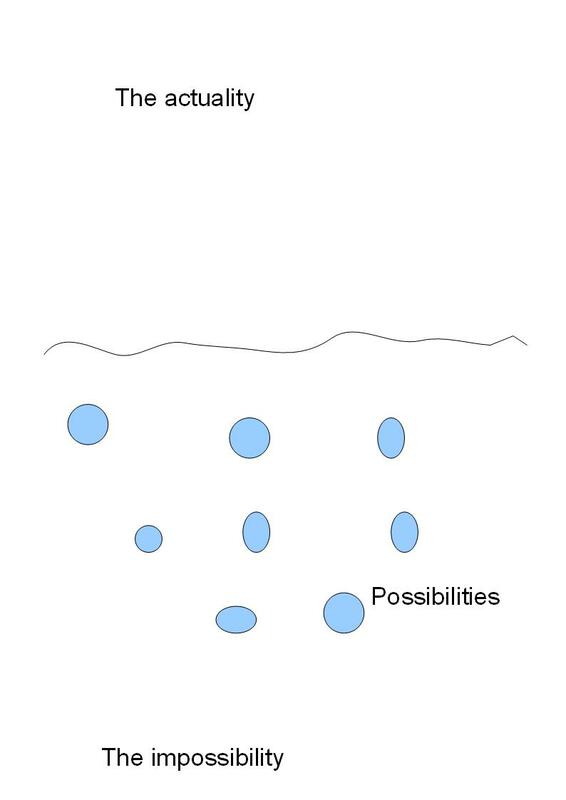 The possible things are like bubbles in a soup of possibility, all trying to float upwards, to the free air of actuality: they are like forces striving towards actualisation. 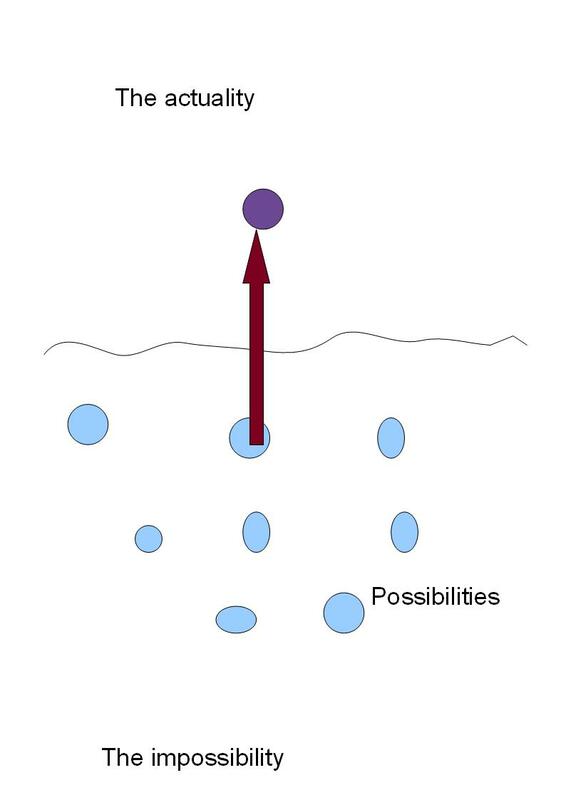 The possibilities have various chances for reaching the surface, but at least they do have the potential to get there, if a sufficient boost is given. Only the impossible residue at the bottom can never rise towards the actuality, because it lacks the necessary impetus even to strive towards actuality. We may now return to Wolff's second argument. Wolff asks us to assume two essentially similar things A and B, that is, things that differ only by quantity and location. If the principle of sufficient ground would not hold, A could be changed in some manner that would not occur, if A was replaced with B. But this would contradict the assumption, because similarity is defined by the characteristic that two things could change their place without any essential difference. Wolff's proof is essentially based on his notion that all things have an essence, that is, a kernel which determines all the other non-quantitative characteristics that the thing has. It is only the essence and characteristics based on it, through which the things can be differentiated. In other words, two completely similar objects must have the same essence. Wolff's proof suggests that the essence of a thing determines then all the possible changes that can occur to this thing. If a thing would change in a manner not based on the essence of the thing, such a change would violate the essential identity of the thing. : this is the crux of Wolff's second proof. Particularly the essence determines the conditions in which a thing with such an essence can be actualised. In other words, essences are the object of the real definitions of Wolffian methodology. 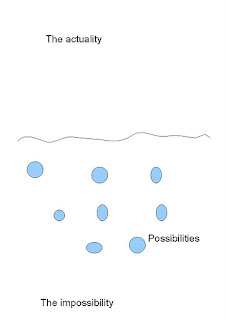 The bubbles of possibilities in the picture above are then just the Wolffian essences. Note that at least at this point of his discourse Wolff appears to accept the possibility that one essence might have several actualisations distinguished only by their location or their quantity (as I have not yet completed the book, the situation might still change). Here Wolff seems to differ radically from Leibniz, who insisted that two different entities must be differentiated by some intrinsic properties. Wolff also notes that essences are eternal and necessary. This does not mean that the essences themselves would necessarily have actualisation. He is merely pointing out that if we take possibilities of things as new things – essences – these things must exist. In effect, Wolff is stating that the realm of possibilities is fixed: no new essence could arise nor could any essence be destroyed, that is, neither any impossibility could become possible nor any possibility could become impossibility. Wolff's framework of modalities undoubtedly can justify the principle of sufficient reason. Indeed, one might say that the principle is built into that framework. But a more doubtful question is how Wolff can justify this system of modalities. Even more confusing is that Wolff connects possibility with non-contradiction. 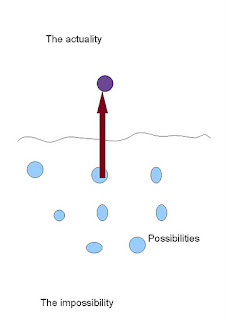 The system of modalities expounded earlier is heavily ontological: possibility of a thing involves some conditions by which it can be actualised. A definition based on non-contradiction would appear to deontologicise the modalities. The most probable explanation is that Wolff considered contradiction also to be an ontological proposition. Thus, in the previous picture of modality, we should think of all the essences as necessarily related to a counterpart – or all the essences that are not necessary or cannot by themselves be actualised. But the other essences form then pairs, only only one of which can be actualised at the time: the actualisation of one essence keeps its opposite unactualised. The possibilities are then not just forces, but forces combating and cancelling one another. Even this explanation merely moves the problem a step forward. If Wolff has an ontological notion of contradiction, then the principle of contradiction becomes suddenly quite problematic. Especially the negative possibilities seem quite problematic: although there might be a force striving to generate horses, it seems ridiciluous to suggest that there is an opposite force acting to destroy horses. As I mentioned previously, Wolff attempts to use the Cartesian starting point as a justification of the principle of contradiction. Wolff's idea is to show that even the Cartesian cogito is based on principle of contradiction: the principle is discovered through one occasion of its use, although once discovered it is self-evident. But it is far from clear that our knowledge of our own existence involves any ontological non-contradiction: I do not believe that I am haunted by a shadow of my non-existence trying to kill me which I would have to actively fight against. Although Wolff's attempt to prove the principle of sufficient reason is then more complex than meets the eye, in the final reckoning it involves a simple failure. By the way, complex and simple things in general will be the issue next time.